China is facing numerous energy and environmental challenges with unprecedented scales and urgency. On the one hand, its weak rule of law often results in ineffective policy enforcement and prevalent non-compliance, which is one key cause of the unacceptable energy-related environmental crises. On the other hand, the country seems to be very capable of achieving several ambitious energy and environmental goals to rapidly improve energy efficiency, bring pollution under control, and develop renewable energy. This presentation explains China’s failures and successes in multiple energy sectors and attempts to provide a generalizable understanding. 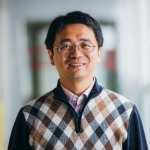 Prof. Yuan Xu is an associate professor in the Department of Geography and Resource Management and leads the Environmental Policy and Governance Programme in the Institute of Environment, Energy and Sustainability, The Chinese University of Hong Kong. His research centers on energy and environmental policies and strategies, especially on their implementation for achieving energy development and pollution mitigation goals as well as related technological innovation and industrial development. Before joining CUHK in August 2010, Prof. Xu received a Ph.D. degree in public policy from the Woodrow Wilson School of Public and International Affairs, Princeton University and was a postdoctoral research associate in the Industrial Performance Center, Massachusetts Institute of Technology. He also holds an M.S. degree in climatology, a B.S. degree in atmospheric sciences and a bachelor’s degree in economics, all from Peking University.